Fields Setup will set a layout you have in the Field Setup section of the component. Set a number of columns and rows if needed, the number of displayed members depends on this setting. 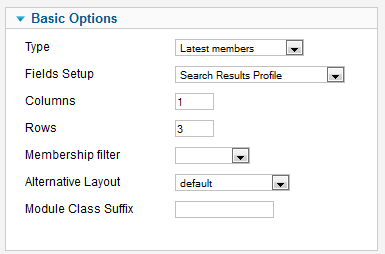 You can add a Membership filter to only show the users with the selected membership. This is how it will look on the frontend with the current settings. This module will add a button on the frontend allowing users to login using the facebook account. To set this module you will have to go to Social Factory Settings. For more about this check the integrations section. After you enable and set up the module this is how it will be displayed on the frontend.